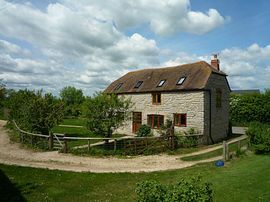 The Barn has a spacious beamed living-dining room, with wood-burning stove plus all fuel included. 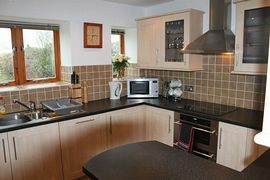 The contemporary kitchen has a cooker, microwave, washing machine and dishwasher and access out to the garden, with a separate toilet, all on the ground floor. A wooden staircase takes you to the first floor, which has a double bedroom with additional single bed (for +1). 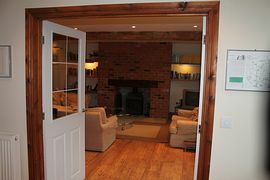 A further beamed double bedroom with TV, Velux windows and en-suite bathroom, with over-bath shower and toilet. 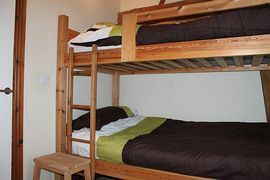 The third bedroom has a bunk bed. The bathroom has an over-bath shower and toilet. 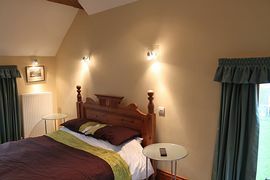 All necessary bed linen and towels are provided. Local Services: Local shop and pub. Road and leading to Highleadon and Tibberton. Follow the road for about 400 yards passing the duck ponds and round a couple of bends. The barn will appear on the left hand side of the road. Pass past the barn and turn into the left. The car park is on the right hand side of the driveway. See map. following the A417 and then follow the instructions above.